My guess is he will be an incarnation of several of the villains that were the Reverse Flash, with Professor Zoom being the main inspiration. It was revealed at the Television Critics Association summer press tour in Beverly Hills today that Prison Break star Wentworth Miller is set to join the cast of The Flash as the leader of The Rogues (and recent Justice League member), Captain Cold. Check it out! This is an impressive bit of casting, and something of a surprise as Wentworth Miller appeared to be moving away from acting after his script for Stoker was met with a great deal of praise. 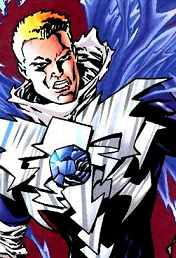 Regardless, he seems like a perfect fit for Captain Cold (especially as the character has been portrayed as a little younger since his debut in "The New 52"), and it should be very interesting to see how The Flash goes about introducing the villain and what his long-term role in the series will be. It was also revealed during the panel that they fought hard to include a Gorilla Grodd Easter egg in the pilot and that they do hope to one day be able to bring the villain into the series, despite not having a budget anywhere near something like Dawn of the Planet of the Apes! How do you guys feel about this news? Sound off with your thoughts below! Many have already seen The Flash pilot, but for those that are waiting until the fall, the CW has officially released three more stills from the pilot along with two previously seen images in HQ. Also, the title for episode four has been released. Come check it out! Looks like we can expect some early conflict between Barry and his new friends. This will be the first in what should be many crossovers between The Flash world and the Arrow world, including a special two-hour event in episode 8. Check out the new stills from the pilot below! Sleepy Hollow's Clancy Brown has landed a pivotal recurring role on the upcoming freshman season of The Flash as General Wade Eiling. Come check it out! 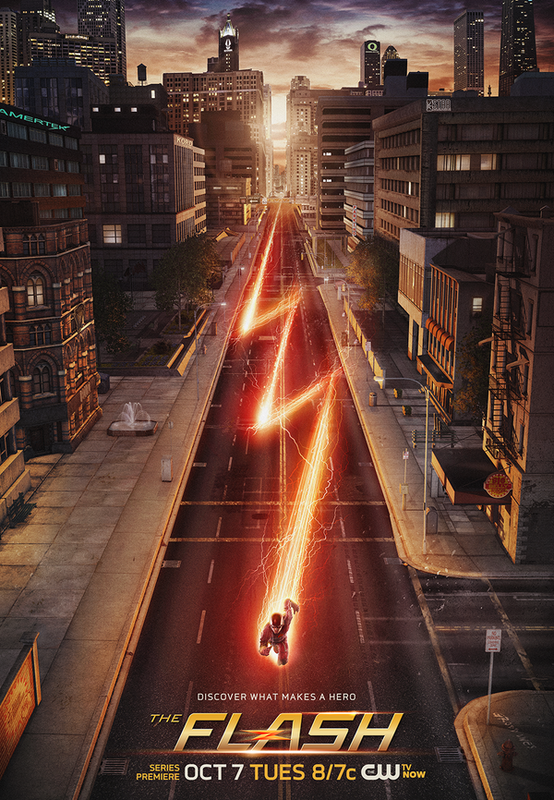 The series which stars Grant Gustin as the Scarlet Speedster premieres this fall! CW's upcoming superhero drama The Flash has added Clancy Brown (Sleepy Hollow) in a major recurring role as General Wade Eiling a.k.a. The General. His character will be the head of a black ops team and will make his first appearance of the season in episode five where he will be in hot pursuit of Kelly Frye's Plastique with hopes of using her as a human weapon. The character has been described as a tall and imposing man, with a "face carved from years of duty," and someone who will be fanatically intent on protecting the interests of Americans around the world. He may also have ties to a central Flash character. This will not be Brown's first foray into the DC universe as he may be more famously known for being the voice behind Lex Luthor in the DC Animated Universe since 1996. General Eiling does have connections to the Suicide Squad, so he may be a future addition to the version of the squad that the Arrow/Flash universe has built. The character has also made television appearances on Justice League Unlimited, where he was voiced by Spider-Man's J.K. Simmons, and on Young Justice voiced by Jeff Bennett. The character is just the latest addition to an already impressive guest cast which features Robbie Amell (Firestorm), Wentworth Miller (Captain Cold), Robert Knepper (Clock King), Kelly Frye (Plastique), & William Sadler (Simon Stagg). The freshman season will also feature special appearances from the stars of its sister show Arrow, namely Stephen Amell (Oliver Queen/Arrow) & Emily Bett Rickards (Felicity Smoak). When Grant Gustin was cast as the titular hero in The Flash, there was some backlash from fans (when isn't that the case? ), but that has changed somewhat since he appeared in Arrow. A leaked version of the pilot episode was also met very positively, as was its premiere at this year's San Diego Comic-Con. Talking to The Hollywood Reporter recently, Gustin was quick to address such criticisms. "If it had been a team of people that didn't know what they were doing, I probably wouldn't have gotten this role because they would have just cast a blonde guy who was buff. They were looking for somebody who encompassed the heart of Barry Allen and at first, I didn't realize I did. Now that I've explored the character, the comics, read the scripts and talked to [the producers], I understand why I got this role." While the Barry we currently know is a little younger and geekier than his comic book counterpart, Andrew Kreisberg told the site that, "By the end of the year, he will come to resemble The Flash that we know from the comic books." You have towonder if that means that he'll be getting a new suit as well! A big part of The CW series will of course be romance, but after waking up from his coma, Barry finds that Central City Detective Eddie Thawn is dating Iris West. "Barry doesn't have many friends. After the accident, Barry really wants to tell her how he feels. When he sees that she's with Eddie, it makes it clearer to Barry how he feels because of how it makes him feel to see her with somebody else." However, don't expect to see too much of the series focusing on this love triangle as the young hero will have his hands full developing his new identity. "He wants to save the day. He wants to be a hero. He wants to prevent any child from going through what he went through, so he's going to put that on his priority list before his love life. He's not going to get in the middle of anything Iris has going and break her and Eddie up. He's going to watch from the outside for now and hold off on telling her." Of course, another potential love interest for Barry is Felicity (Arrow's Emily Bett Rickards), and her appearance in episode four "does complicate things for Barry," the actor teased. However, doesn't she have a thing for a certain hooded hero? "We left their relationship on a weird note [on Arrow], but she's also in a weird predicament with Oliver where she clearly loves him. Barry and Felicity clearly have a lot in common but I don't know that any of those relationships are going to work out. At the same time, it's not something he can worry himself with too much right now." The CW's upcoming small-screen take on the fastest man alive has added yet another DC Comics villain to its roster in the form of Tony Woodward, also known as Girder. Greg Finley (Star Crosses) will play the character, who has ties to Barry Allen's past..
Zap2it are reporting that Star Crossed actor Greg Finley has joined the cast of the CW's Flash tv series as Tony Woodward, aka Girder. It seems the S.T.A.R. Labs explosion in the pilot episode gives Woodward the ability to transform his skin into metal, and in episodes 6 and 7 of the series he'll be giving Barry Allen (Grant Gustin) plenty of headaches...especially when you take into account that Woodward used to bully young Barry back when they were in school. Finley has also appeared in the likes of The Secret Life of the American Teenager, Law & Order: SVU, Emily Owens, MD and House. The Flash races to our screens on Tuesday, Oct. 7 at 8 p.m. ET/PT on The CW. The Rogues will start getting together pretty early on in the first season of The Flash by the sound of it as Dominic Purcell (who has been cast as Heat Wave) and Wentworth Miller (Captain Cold) will reunite on screen for the first time since Prison Break. Read on for details! The Hollywood Reporter reveals that Dominic Purcell (Blade: Trinity) has joined the cast of The Flash as the villainous Heat Wave. He'll first appear in the tenth episode, and his appearance will be alongside Wentworth Miller, the Resident Evil star who has been cast as Captain Cold. This marks the first time the duo have appeared together since playing brothers Lincoln Burrows and Michael Scofield in Prison Break. Captain Cold will make his debut in episode four, and Heat Wave will apparently also be heard from there. 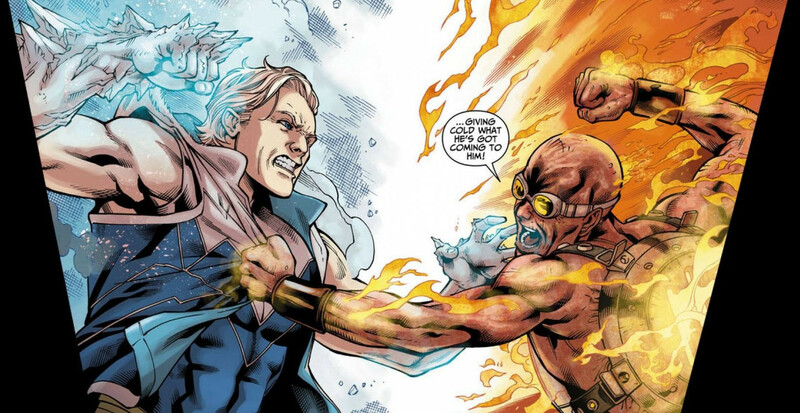 The site describes the character as, "a pyromaniac who finds an outlet for his obsession with fire when he teams up with Leonard Snart/Captain Cold and becomes the villain known as Heat Wave." This cast just keeps getting better and better, don't you think? Be sure to share your thoughts on this news in the usual place! The CW has released a new promo for the upcoming series “The Flash” which not only features some new footage from the series but also interviews with cast members Carlos Valdes and Danielle Panabaker discussing their characters. In addition, the promo does provide a bit of a teaser for some of the other heroes that will appear in the series such as Valdes’ Cisco Ramon, AKA Vibe, and Robbie Amell’s Ronnie Raymond (the fiance to Panabaker’s Caitlin Snow), who is one half of the hero Firestorm. Check it out in the player below. “The Flash” arrives from co-creators Greg Berlanti and Andrew Kreisberg, who, along with Geoff Johns, wrote the pilot episode which was helmed by “Arrow” pilot director David Nutter. Gustin will star as the titular hero along with Candice Patton as Iris West, Jesse L. Martin as Iris’s father, Detective West, Michelle Harrison​ as Barry’s mother Nora Allen and many others, including John Wesley Shipp, from the original “The Flash” TV series, as Barry’s father. 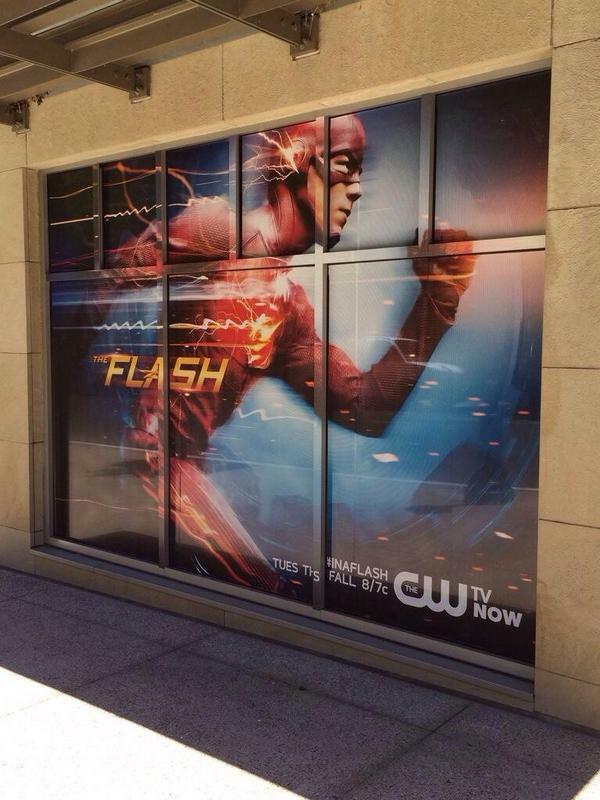 Set to premiere on October 7, “The Flash” will air on Tuesdays this fall. Talking in detail about some of the Rogues who will be causing problems for The Flash during his first season, executive producer Andrew Kreisberg drops some intriguing hints about Captain Cold, Heat Wave, Clancy Brown's General Wade Eiling and more. Check it out! The hardest thing is that some of these characters have been around since the '50s and '60s, and they could very easily head into camp. And when you hire people like Wentworth Miller [as Captain Cold] and Dominic Purcell [as Heat Wave] and Rob Knepper [as Clock King], some of these outlandish comic book characters become very grounded and very scary and very real. I mean, with Wentworth, no pun intended, he's just so cool -- he's so cool, like Clint Eastwood. He's like an Old West gunslinger, and that's sort of how we portray him. You're only as good as your villain, and especially in movies, some of the Batman movies have had some of the greatest actors: Heath Ledger and Liam Neeson and Tom Hardy playing these villains and they really feel like threats. And sometimes on TV it's harder to make that happen, and we've been so blessed on "Arrow" with John Barrowman and Manu Bennett, and on "Flash" on Episode Four we've got Wentworth Miller, and in Episode Five we have Clancy Brown [as General Wade Eiling]. So we just feel so blessed that we've been able to attract the kind of talent we have, because in addition to the visual effects, if you don't have these amazing actors it's just a cartoon. I guess it's comic book tv show day! Now EW report that Spartacus actor Nick Tarabay has joined the third season of the CW's take on DC's Emerald Archer as a baddie usually more associated with The Flash, Digger Harkness (aka Captain Boomerang). Another major DC supervillian will make his live-action debut on the CW's third season of Arrow. According to Entertainment Weekly, Spartacus' Nick Tarabay (who also appeared in Star Trek Into Darkness) has signed on to play Aussie nutcase, Captain Boomerang. The character is normally more of a thorn in Barry Allen's side, but it seems we'll be getting the best of both worlds as Tarabay is expected to debut as Boomerang in episode 7, and then also appear in episode 8 which will be the Flash crossover ep. For the purposes of the show "Harkness will be a former A.R.G.U.S operative, highly skilled in martial arts and espionage, with a deadly thirst for vengeance against his former employers." The Flash debuts Tuesday, Oct. 7 and Arrow returns for its third season on Wednesday, Oct. 8. THE FLASH Star Rick Cosnett Talks 'Reverse-Flash', 'Wally West' And...'Cobalt Blue'? In the comics, Professor Zoom (a.k.a. 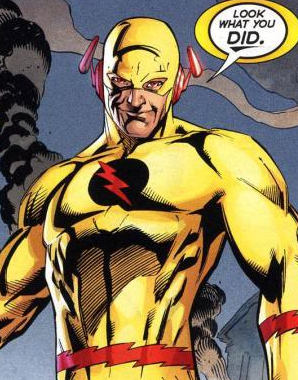 Reverse-Flash) has a few different origins, but most have him hailing from the 25th Century. 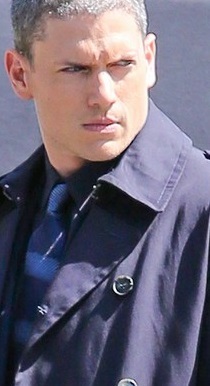 He's certainly never been a detective in Central City! It could be then that Rick Cosnett's Eddie Thawne is an ancestor of Eobard's, and he talked to Comic Book Resources recently about how The CW's The Flash will explore his family and their connection to the Allens. "I think that's going to be the intriguing thing to see, whether he's the white or the black sheep of this family of Thawnes. I think the producers are up to do a lot of twists and to really shock the fans, especially in terms of the first season. The intriguing thing is, "Who are these people, really?" We're trying to show the humanity of them, in social situations and in the present day, I think. It's also quite funny, which I think is going to be surprising to people. It has little gags and everything. It's epic, but it's also human and funny." The actor then went on confirm that he's been reading up on the Reverse-Flash in case he ends up taking on that role somehow, and talks below about what he finds interesting about the Thawnes. He seemingly goes on to confirm that both Reverse-Flash and Wally West are indeed on the way, along with Cobalt Blue! "It was fascinating to me, and I think the family lineage -- they're quite wealthy and they're from this old money world of deep, deep dark secrets. It's also fascinating with the whole Barry's twin [storyline], and who that is and who it's going to become. 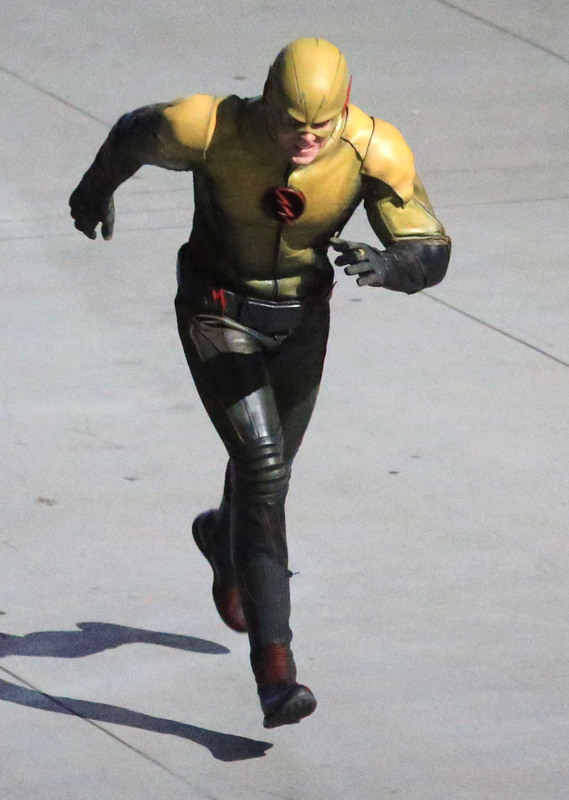 You also not only have the Reverse-Flash, you also have the Wally [West] kid, and we've had Wentworth Miller on the show and all sorts of amazing guest stars like Robbie Amell already. Things are turning over quite quickly, and I think you're going to see some people in other suits pretty soon." Of course, Cosnett could be referring to what he found interesting in the comic book here, but the fact that he includes Wentworth Miller in the same sentence makes me think they're elements that the show will explore. For those of you who don't know, Cobalt Blue is Barry's twin brother who was stolen by an inept doctor responsible for killing one of the Thawne's children. As a result, he was brought up the this family and ended up becoming one of Barry Allen's main villains! First Look: Reverse-Flash/Prof. Zoom Costume On Set; He's Fighting THE FLASH! Hit the jump to get your first good look at the 'Reverse-Flash'/'Professor Zoom' costume on the set of CW's The Flash. This is a fight scene between him and The Flash. Let them fight! 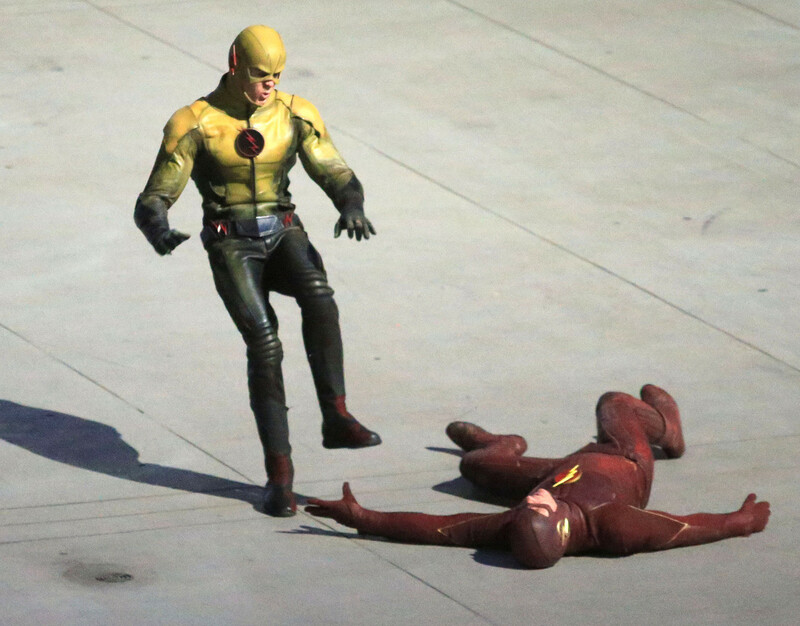 Last night in Canada The Flash was spotted filming a fight scene for an upcoming episode. 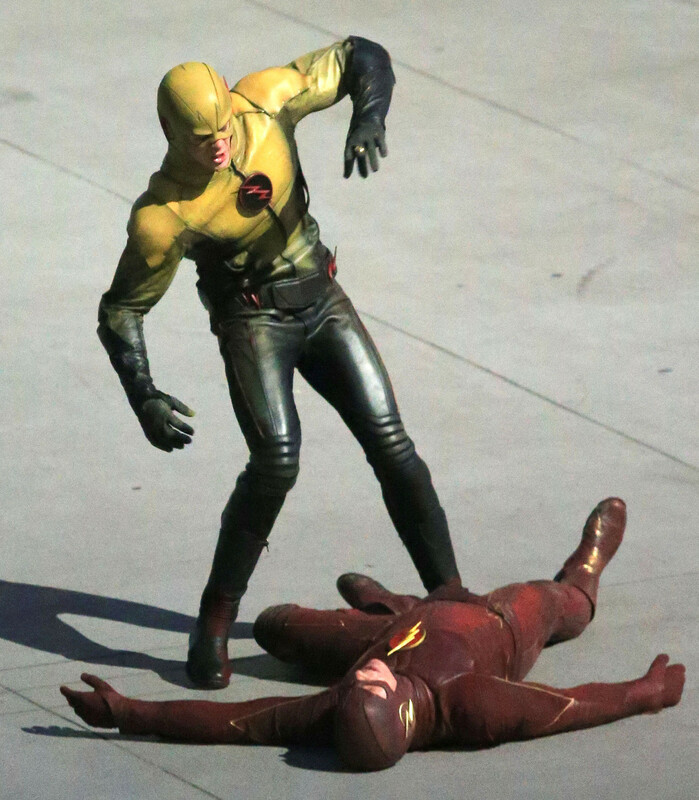 The fight features stuntmen dressed as The Flash and another dressed as 'Reverse Flash'/'Professor Zoom.' This is our first look at The Flash's arch-nemesis on the set. Based on these images, The Flash looks to be outmatched. Oh, no! Besides wearing a yellow (and black) costume that's nearly identical to The Flash, this super-villain comes from the future, the 25th century to be exact. He uses his exceptional speed to travel in time. In the comics, he uses that ability to screw up The Flash's life. We saw a glimpse of that villainy in the pilot. 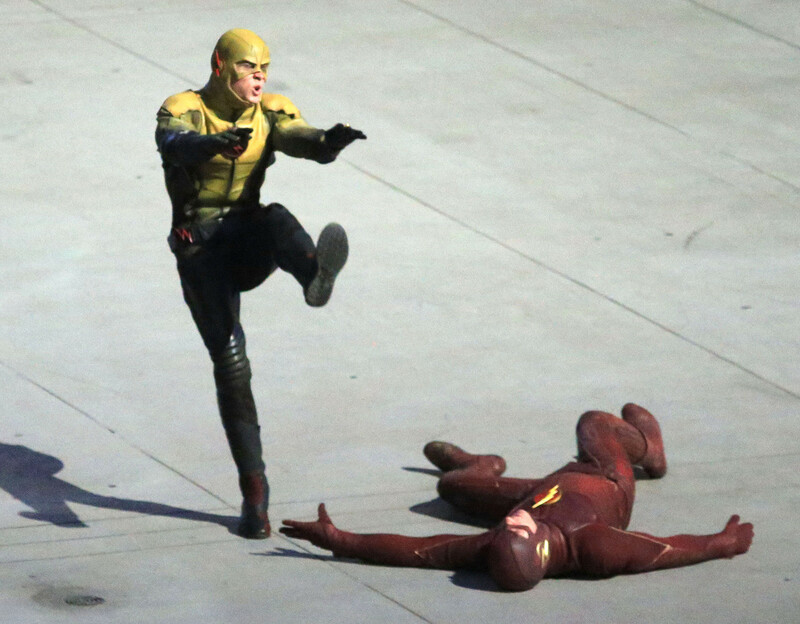 He's the yellow blur that young Barry Allen sees murdering Barry's mother (Michelle Harrison). Alias star Victor Garber (whose other credits include Sleepy Hollow, Louie and The Good Wife) has been cast as Dr. Martin Stein, the other half of Firestorm. He'll make his debut in the first season's twelfth episode and it's described as a recurring role. Variety have an official description of the character in The CW series, confirming that he will indeed become the hero after being bonded with Ronnie. "Martin Stein is described as a brilliant but arrogant nuclear physicist who has sacrified everything, including a marriage, for his work in transmutation. After he discovers the particle accelerator fused him with the younger, more impulsive Ronnie Raymond (Robbie Amell), he races to find a way to separate the two before it’s too late." It's going to be very interesting to see how they handle the character, especially as they're clearly looking at the pre-New 52 Universe as Jason Rusch is currently the other half of Firestorm. 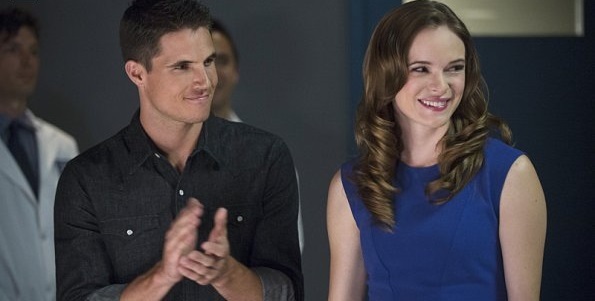 Robbie Amell Reveals Major Details About 'Firestorm' In THE FLASH; "He's Very Powerful"
Robbie Amell reveals major details about his role as Firestorm in The Flash in this interview, revealing how the Ronnie Raymond/Martin Stein relationship works before promising a faithful take on the superhero for comic book fans and even teasing the powers we'll see him use! "You meet Ronnie Raymond tomorrow [in "Fastest Man Alive"] and then in December, you meet Firestorm," Robbie Amell (cousin to Arrow star, Stephen) confirmed in an interview with The Hollywood Reporter when asked exactly how long we have to wait before meeting Firestorm in The Flash's first season. "It'll take a minute before Firestorm turns back into Ronnie because when they find him in December, my character is really going through some stuff. He's schizophrenic, doesn't know what's happening, he's confused and dangerous to the people around him. You may not see Ronnie Raymond for a little while, but you'll see Firestorm." As for how faithful an adaptation this will be, it sounds as if we're definitely going to see the Firestorm from the comic books. "People will barely recognize him in December," he said of Ronnie's fate, adding: "but they'll know it's him when the fire bursts in the hands and the fire bursts in the head. The particle accelerator almost killed Ronnie and the fallout from it will definitely be seen in December." It was recently announced that Victor Garber (Fringe) will play Martin Stein, the other half of Firestorm. Thanks to Amell, we now know how that relationship will play out, as he told the site that the character will constantly be portrayed as being in his body, but his mind will switch between Stein and Raymond. "I gotta start watching Alias and start working on my Victor Garber impression. Sometimes Firestorm is Ronnie and sometimes he's Martin Stein, but physically it's going to be my body. I'm just excited to work opposite him because, I mean, he's Victor Garber. The fact that I get to share a character with this guy is going to be really fun." As for the powers we'll see during his appearances in the series, Amell couldn't give too much away, but did confirm that he'll be shooting nuclear energy out of his hands! What do you guys think? Genera Hospital star Roger Howarth has been added to the cast of The Flash's first season in a role which sounds like it will have major ramifications on the lives of both Barry Allen, Iris West and the mysterious Harrison Wells. Hit the jump for details! 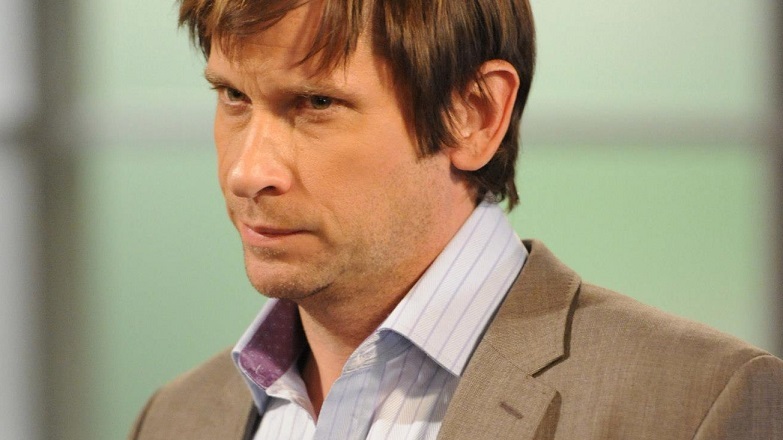 According to Deadline, Roger Howarth has landed a recurring role in The Flash's first season on The CW. The site reveals that he will play Mason Bridge, an award winning Central City Picture News reporter who is assigned to watch over new employee Iris West (confirming that we'll get to see Candice Patton delve into her character's future career as a journalist early on in the series). However, their relationship apparently becomes complicated when he starts to investigate Barry Allen's mentor, Dr. Wells. Will we finally learn his true motivations? I've done some digging and Bridge doesn't appear to be a character from the comic books. Of course, if you know differently or have any theories of your own, be sure to share them with us in the comments section below!